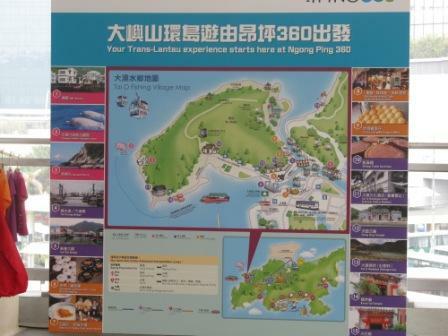 We wanted to go to Hong Kong Ngong Ping 360 tour for many years. Every time when we were ready, the cable cars had some problems that they stopped its operation. We finally had our chance in Oct 2012. Just before reaching the ticket office, we were approached by a few ladies representing a local travel agent. 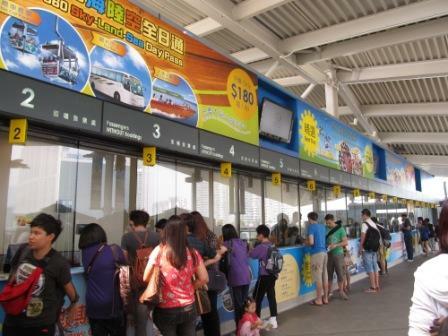 We bought the tickets and proceeded to the Hong Kong Ngong Ping 360 tour ticket office to exchange the actual tickets. While we were waiting, it finally sank in on how much money that local travel agent saved us. It was really a steal. As of Oct 2012, the price difference of the tickets we got from the local travel agent was $180/adult for a crystal-bottom cable car cheaper and $140/child lower than bought from the box office. If you think about for a family of 4, that is a lot of money. But remember, there are at least 2 local tour companies out there offering similar packages. You need to make a little bit of comparison which best fit your need and schedule. 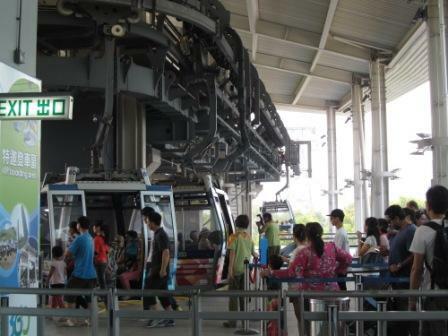 There were many people in the cable car station. But thankfully the line moved at a reasonable speed. It took about 20 minutes totally before stepping into our cable car. Just before we all got settled in the cable car, a Hong Kong Ngong Ping 360 tour photographer came to take a picture of us. You will have the chance to see it when you get off the cable car at the other side of the mountain. The cable car started to move and elevate. 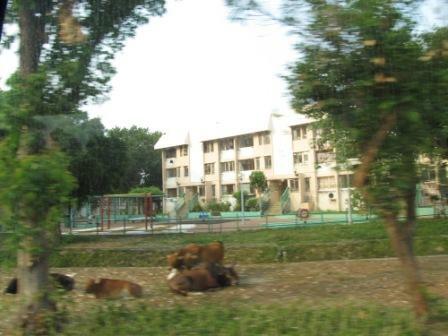 Looking at the housing estates and the ocean from crystal-bottom cable car was very different. What amazed me was that not far away from the modern construction, there were several villagers putting on traditional Chinese outfits with a bamboo basket on hand to fish for clams by the shore. 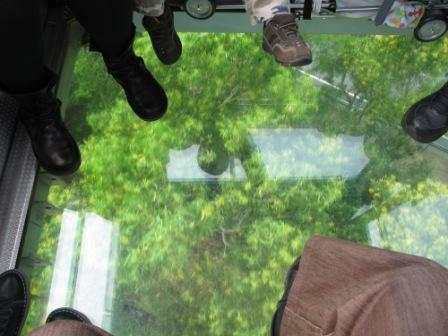 Look at this crystal bottom of our cable car. How do you feel? I love it. One of my sisters is afraid of height. She literally was holding on her breath throughout this 20-minute trip. As we climbed up the mountain in the cable car, we saw a trail. Some Hong Kong people walked along. At the same time when the elevation got higher and higher, we felt the chill. I would recommend to bring a light sweater or jacket with you. You may also need it later in the Giant Buddha. 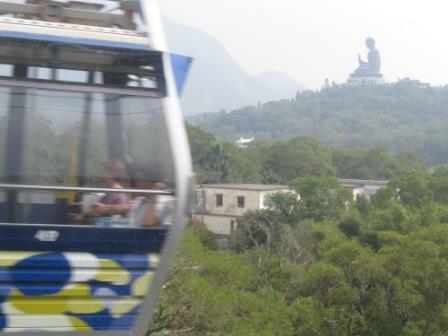 The (Hong Kong Ngong Ping 360 tour) cable car trip lasted about 20-25 minutes. As soon as we got off, we saw a Hong Kong Ngong Ping 360 tour staff holding up our picture. You could either buy it with other accessories, such as key chain, globe or just the picture. If you are not satisfied with it, you can walk away. NO obligation at all. We decided to buy a package. After the transaction, we got a coupon to get another free picture from a store in the Ngong Ping market. The store name is "Hong Kong Love". 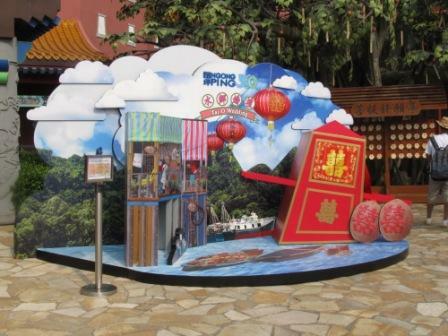 Along the way, there are kiosks to take picture with Chinese traditional replicated settings. You need to pay again for the pictures. Of course, there are also kiosks you can take pictures freely. 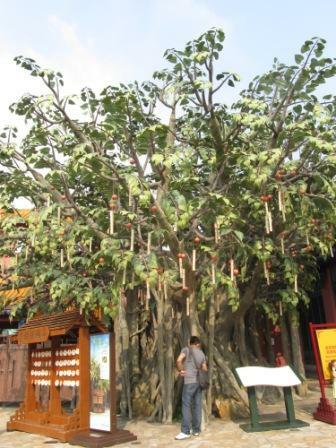 Some of them worth a stop, such as the replica of the Lam Tsuen Wishing Tree because the current tree doesn't look like this anymore. There are many stores and restaurants along the way. If you want to stop to eat, you can literally find any cuisines you want with a very affordable price. Then, we proceeded to the Monkey's Tale Theatre. The schedule was like every 45 minutes. So, we went to check out other stores while we were waiting. 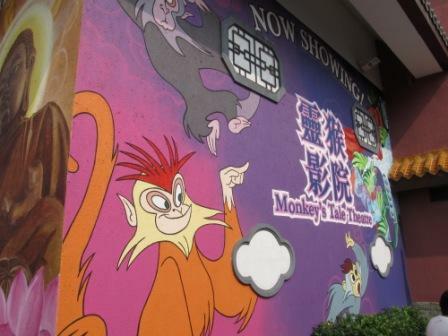 Just by looking at the theatre name, you can guess that it was a funny cartoon about monkeys. It was very similar to the 3D theatre in Disneyland Hong Kong. Of course, my 3-year-old loved it. The whole cartoon lasted about 15 minutes. In my opinion, kids would love it. But for adults, you may think that it was waste of time. In Perry's opinion, he liked this story about ethics. He wished it longer. 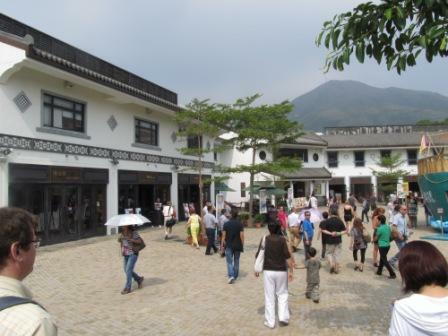 During our Hong Kong Ngong Ping 360 tour, Perry exclaimed this several times, "Look at this place. When we were here last time, it was peaceful and solemn. Now it's all about the tourists and money. I like how it looked before. I am glad that we came in the past." After the show, we took the coupon for a free picture to the "Hong Kong Love" store. In there, of course, they took a few more pictures to try to sell you more. Then, another Hong Kong Ngong Ping 360 tour photographer took us out of the store to use the Giant Buddha behind us as the background for a few more pictures. I got to say that this photographer not only professional, but also funny. It is always difficult to make my son to stay still to take a picture. He made it happen. After that, we headed to the bus station for the Tai O fishing village. Not until later, I realized that we could have gone to check out the Giant Buddha while we were here. It is just a couple hundred feet away. 1) During the fall, I would recommend for you to bring a light jacket along. As the elevation climbs, it may get chilly. 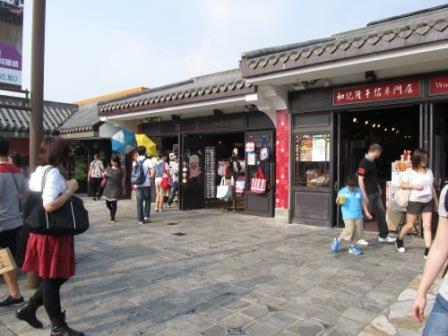 2) There are a lot of kiosks and staffs try to take pictures for you and sell them in package. The backgrounds are very neat. It's definitely great for souvenir and memories. However, it takes up some of your time to line up taking pictures and checking them out. Each stop of a kiosk for the pictures takes up at least 20 minutes. We stopped at 2 kiosks for pictures which cost us at least 40 minutes. And it didn't count the time that we stopped at the stores to shop and in the restaurant for our lunch. 3) If your plan to have a Hong Kong Ngong Ping 360 tour and visit the Giant Buddha, it will take up at least half a day of your time. 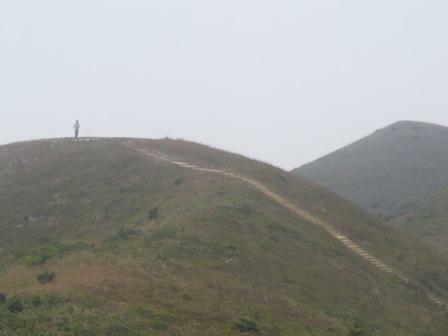 If you plan on a whole Lantau Island tour, it will be an entire day. Make sure to start out early, too. 4) Since the cable car is out of order on a regular basis, we highly recommend you to check out their operation before heading out for your trip. We can not emphasis enough how important this step is. This will save you a lot of traveling time and aggravation. 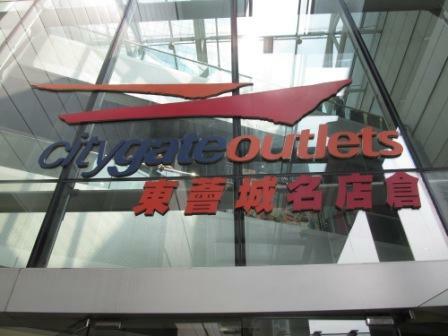 5) For a full day trip, you can either eat in the mall, Ngong Ping Citygate Outlets. It is right across from the cable car station. Another option is to eat on the Hong Kong Ngong Ping 360 market. Although Perry didn't like the crowd of this place, I got to say that it is much more convenient than in the past. You can have any cuisine over here. And they are in fast-food style which charges you the same price anywhere else. In the past, you could only buy drink and snack from a few stalls that charged ridiculous price. So, this is a BIG improvement. 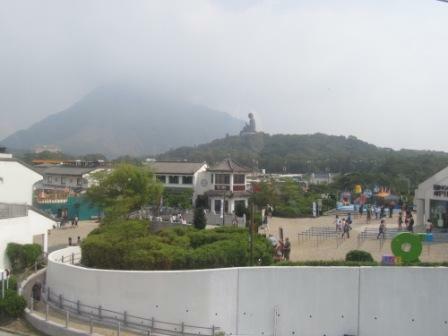 For more info about Hong Kong Ngong Ping 360 tour, click here. 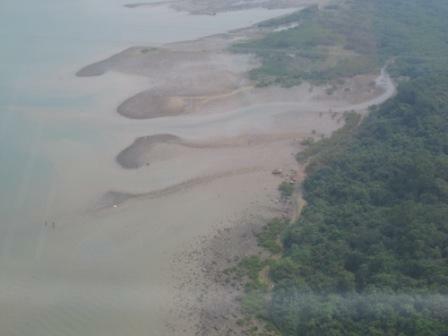 Check out the pictures in our FB page. Direction: MTR Tung Chung Station, Exit B. 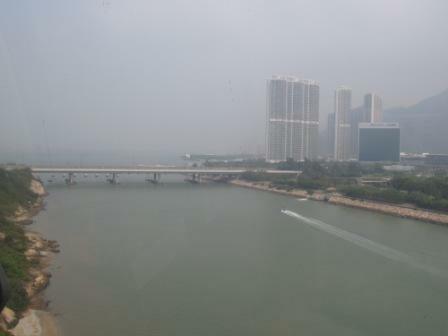 Walk for approximately five minutes to the Tung Chung Cable Car Terminal.